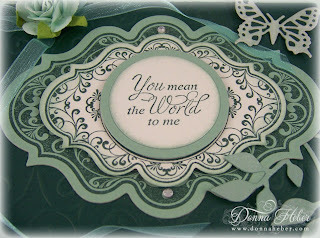 wow donna gorgeous card, beautiful color and stamps. I love the colors you used! I have these stamps from Justrite! Your card is beautiful! Oh my, what a stunning card! The hunter color is so unusual but it just makes your card so very elegant and beautiful. LOVE the inside stamp - the scrolled letters are stunning! 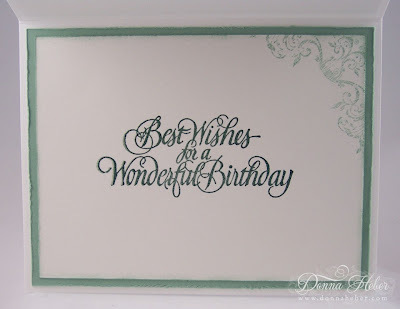 This is a beautiful card Donna - it is so elegant! I love the colours you have used. It is one of the nicest I have seen - absolutely stunning! OH wow Donna, this is elegant! Love this stamp. 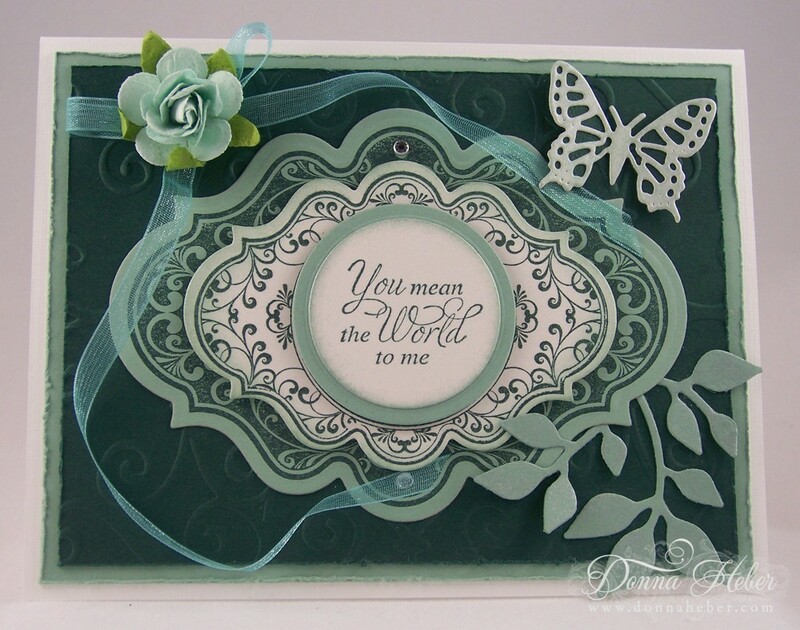 Donna wonderful card terrific colour combo... lucky girl receiving it. Beautiful job Donna! I sooo miss PSX stamps! What a lucky lady your co-worker is to get a custom made birthday card! You did a wonderful job on it! What a lovely card. You always make such beautiful cards. Thank you, Donna, for sharing such a beautiful card. Your co-worker will love it! It really is stunning. 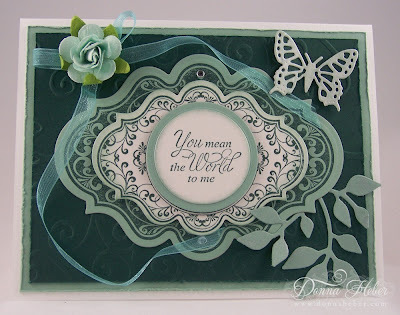 Stunning card Donna - the details and layout is simply beautiful. Saw it on MIM and wanted to take a closer look at those dies cuts - extraordinary. Thanks for sharing. This is a very Beautiful creation ! Love your colors and the frames. Beautiful, I love the colours you've chosen to use. I saw your card on Make it Monday, I'm my lucky number '7' this week. Stunning card, very elegant! The die cuts look amazing layered like this and the paper is just gorgeous. 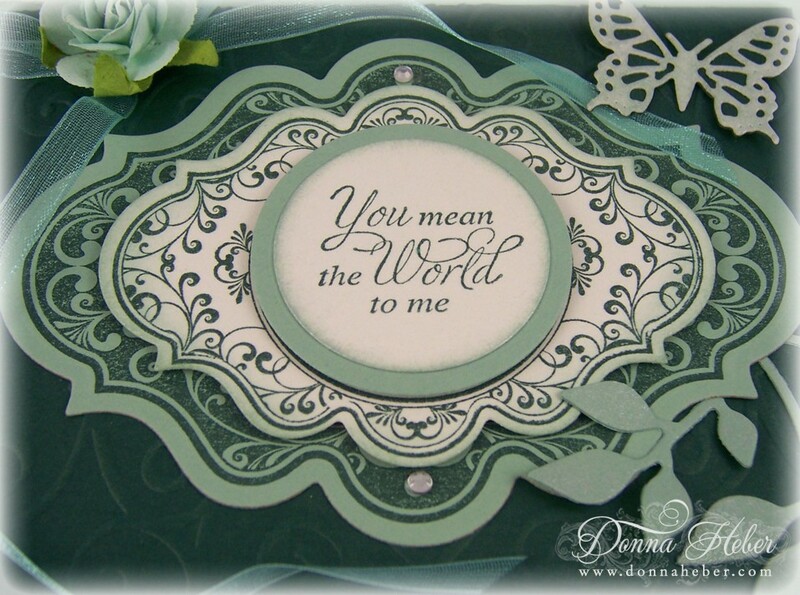 Donna, I like your cards that I've seen on the JustRite site. Your cards are lovely while remaining PRACTICAL. That is, they do not require special envelopes or boxes for mailing because they are NOT square or too bulky. Your designs are not predictable. Each card is unique, and they are not overly-decorated with thick, large bows and trailing ribbons and dripping pearls. Your cards can be easily mailed, and it takes more creativity to create designs to fit standard rectangular cards than it does to create a design of any size and then cut a 10x10 card to fit the design.